This course is for those who genuinely love to sing. Many people are naturally gifted with the ability to sing, but whether you want to become a professional entertainer, to perform occasionally, or just sing for fun, it is important to learn how protect your instrument and to increase it's potential. We believe in the power of the human voice and that anyone can express themselves vocally, no matter what their previous experiences may have been. We know that everyone can train his or her voice to be stronger and more colorful, and we believe that full vocal expression leads to deeper personal fulfillment. 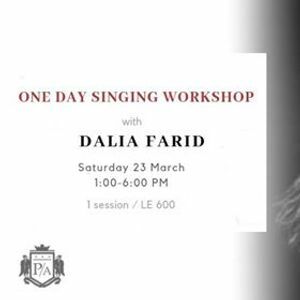 Dalia Farid holds a Musical Theatre Masters degree from the Royal Academy of Music in London as well as a BA in Political Science from the American University in Cairo, AUC. Her performances include appearances at the Savonlinna Opera Festival in Finland and the Cairo Opera House. Combining her musical and acting skills, Dalia’s first opera was AUC's production of "Dido and Aneas", 2009 under the musical direction of her vocal coach Dr. Neveen Allouba. In 2013 She played the main role of Fantine in a version of "Les Miserables" translated into Arabic and adjusted to depict the Egyptian revolution. That year she appeared as a guest soloist with the Egyptian Philharmonic Society at the Cairo Opera House performing arias and musical theater repertoire. She also performed in the "Old is Gold" concert series with the distinguished Bibliotheca Alexandria Orchestra at the Alexandria Library and appeared as soloist Gomhoureya, . At the Royal Academy of Music she played "Meg March" and "Clarissa" in Little Women directed by Paul Warrick Griffen and choreographed by Drew McOnie as well as "Alison Du Bois" and "Barbara" in Lady in the Dark directed by Matt Ryan. Dalia appeared as a soloist in cabarets including the World War I 100th anniversary cabaret and “Till the Clouds Roll by- a Jerome Kern Tribute” in the St James Theatre in London. She participated in master classes with Opera instructors Tom Krause, Csilla Boross and Eija Tolpo as well as Musical Theatre giants Andrew Lippa and Jeremy Sams. In April 2015, Dalia made her national theatre debut on El Hanager Theatre playing the main role of “Mary” in an original Arabic musical, “Badlat Al Barq Wal Saqeea” where she and Egyptian conductor George Kolta wrote the music. In September 2015, Dalia played the leading role of “Amal” in the Arabic Opera “Ayam w Layali al Shagara alQalb”, performed by the exceptional blind girls orchestra, El Noor Wal Amal. In 2016 her mother Dr. Mona Zaki, leading Egyptian businesswoman and professor, founded “Soft Power Productions” to help support the arts in Egypt. In 2017 she choreographed and played the leading role of the Witch in the first Arabic Rock musical ever written “LEILA” by Ibrahim Maurice, the first musical to take place in Egypt since the 1950s and a joined production between Soft Power Pro and the Egyptian Musical Theatre Company. 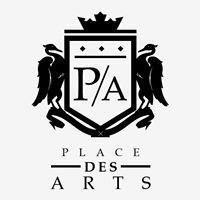 Dalia’s repertoire includes Opera and Musical Theatre, Jazz, Pop, Folk, French chanson and Arabic music. 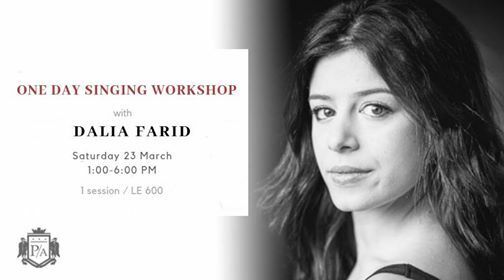 Her dream is to continue to be part of artistic endeavors all over the world and in particular to see a thriving Musical Theatre scene revived in Egypt. In March 2018, she released her debut album which she wrote “Kingdom of the Heart” now available on Anghamy, ITunes, Spotify and Deezer. • Full refund until 1 week before the starting date. • 25% of fees deduction if cancellation is less than 3 days before the starting date. • Only 25% of the fees will be refunded if cancellation is before half the workshop classes are given. • No refund if cancellation is after half the workshop classes.